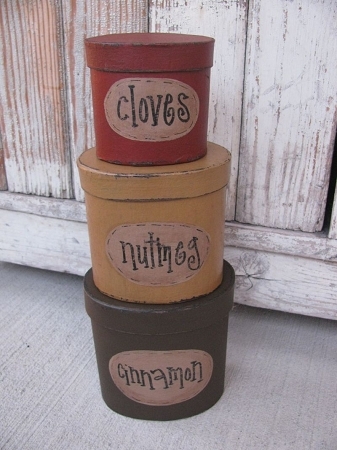 Primitive Country Baking Spices set of 3 tall oval stacking boxes. 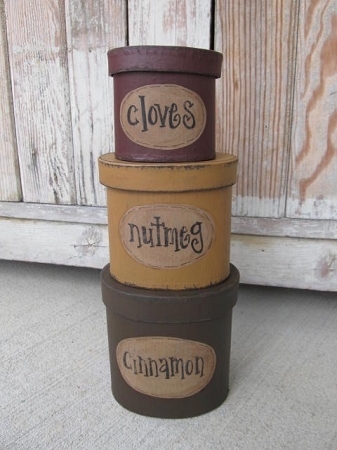 Great kitchen decor or set out for the fall decorating season, since these are the most popular fall spices. New color design of brick red, old forge mustard and milk chocolate brown. I can change out the color of brick red to a burgundy color if you desire. Size stacked is 12" and the bottom box is 5" across. I've painted on tan colored ovals to look like labels and hand wrote each each spice name. They have been antiqued and stained for a worn look. Hand painted, designed by Heidi. August 2014 Country Sampler featured item.